I recently returned to an old creative writing class to talk about Twitter for half an hour. If you’re on Twitter, you’ll know that half an hour isn’t long enough to explain how it works, and with all the questions, I ran out of time to complete the workshop I’d prepared. 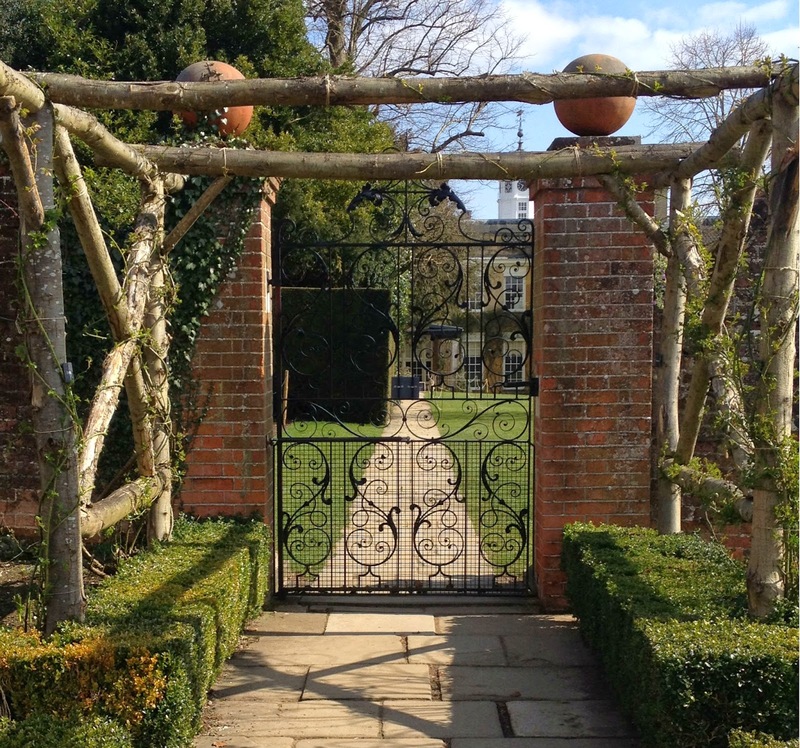 So, I’m going to run an ‘Introduction to Social Media for Writers’ course in Surrey in April. During my talk, there was some discussion about whether an unpublished writer would gain anything by being on Twitter. So I thought I'd write a blog post explaining why I think Twitter's worth it for unpublished writers (of course, I'm referring to those who'd like to be published in some way, at some point in the future). Twitter has enhanced my life as a writer, and I find myself defending Twitter whenever anyone questions its existence. Your Twitter timeline can be a river of opportunities, and you never know what you might catch. As long as you’re careful about the time you spend on Twitter, ie: not all day every day*, you’ll still get your writing done. Three authors who manage Twitter well are Alison Morton, Talli Roland, and Sue Moorcroft. Alison was a guest on this blog in February with ‘Alison Morton on Twitter’, Talli will be a guest with a post about Facebook on 24 April, and Sue will be a guest with 'Balancing Writing with Social Media' on 5 June. *Yes, I spent hours on Twitter, when I first joined. Those were the days, back in 2011, when Twitter was more chatty than promo-based and it was easy to get caught up in conversations with several people at once, for ages. Since then, I’ve learnt to manage the time I spend on Twitter more efficiently and I maintain the accounts for The Historical Novel Society (@histnovsoc) and @neetsmarketing using a 'strategy' which involves shortcuts and ways to find the right content to share as quickly as possible. I schedule Tweets on Tweetdeck in advance and drop in to those accounts now and again during the day to find good content to retweet. If I become a published author, I’ll probably manage my Twitter account in a similar way, with personal Tweets as well, like those I currently post from my @neetswriter account (and not too much of my own promo ideally). If you struggle to get yourself off Twitter: The key is to set a timer (I use the one on my phone), it’s the only way to ensure you get your writing done too. For a personal, writer’s Twitter account (like my @neetswriter account), 10 minutes per day is manageable during busy times, if you go about it in the right way. Initially you’ll probably need to spend more time on Twitter, to familiarise yourself with how it works, and to gain followers etc. Once you’ve built up your followers, a Twitter account is easier to manage. The publishing industry changes almost daily, especially because of the “ebook revolution”, and there are plenty of links to blog posts and articles which tell you what's going on. You become familiar with the names of literary agents (and which agents work for which agency), independent publishers, traditionally published authors (and who their agents are), and successful self-published authors. A good online profile can only be a positive, when submitting to agents and independent publishers, who I’ve heard often Google your name when receiving submissions. This happened to me last summer when an agent reviewed a full manuscript for my Book 1, and said that although the book wasn’t for her, I have a great profile. The best rejection so far, if only she'd liked the book. ‘When’ (of course!) you are published; traditionally or self-published, you’ll have your Twitter account ready ‘to go’. It takes a while to gain a substantial number of the ‘right’ followers, ie: followers who might want to read your tweets, or books at a later date. If you aim for the traditional route first and struggle to get a book deal, your Twitter account will be set up and ready to go in the case that you choose to self-publish. Having a social media presence is essential if you’re self-published. 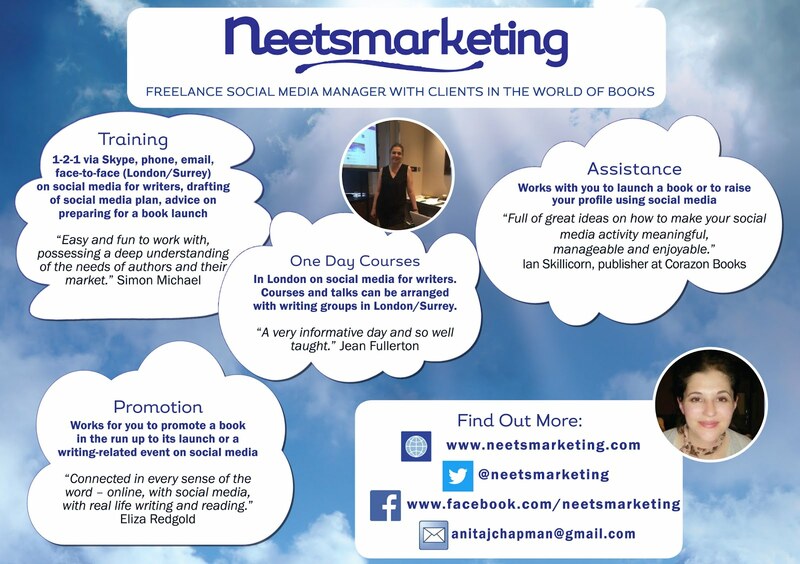 The New Romantics Press can tell you more about that in their guest post, 'Marketing Books Using Social Media', on 15 May. There's a lovely writing community on Twitter (who you can often find through #amwriting). I’ve met other writers who have given me feedback on the full manuscript for my Book 1, and whose novels I’ve read before they were published. Michelle Flatley included me in the acknowledgements for her wonderful novel, 'My Beautiful England' because I gave her feedback on the first few chapters when it was in its early stages. What a lovely surprise that was when I reached the end of the published novel! Some writers have given me great advice re which path to follow when I get stuck, ie: 'carry on with Book 2, leave Book 1 alone for a while…', which I’m now doing (see Getting Back Into Writing After a Break on my neetswriter blog). Writing can be lonely, and there aren’t many writers around in everyday life, so it’s nice to be able to speak to them online. Because other writers ‘understand’ when you say that you’re stuck on a point in your plot, you’re frustrated because you can’t focus on your WIP, you continuously get lost in research, or you can’t work out how to make your main character a less irritating person. Sometimes when I’m struggling with my WIP, and I see Tweets saying, ‘Wrote 2000 words in the past hour’, or ‘Just won a short story competition’, or even ‘I got a book deal!’, this makes me think, I need to GET ON WITH IT, and stop dithering. Blog posts and articles written by successful authors are often inspiring, and they can give you ideas on how to finish your novel, get published etc. Being on Twitter is a great way to find out about writing competitions too, if that’s what you’re into. I’ve stopped entering them for a while, as I went through a phase of using them as a form of procrastination. I once tweeted a question about how long it would take a stagecoach to get from the Cotswolds to Surrey in 1750. Someone replied almost instantly, directing me to a brilliant website, an eighteenth century version of The AA Route Planner. Sometimes I see great blog posts on the eighteenth century, and find out about research books that way too. 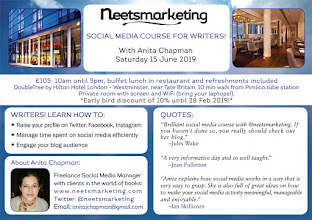 If you’d like to find out more about my ‘Introduction to Social Media for Writers' course in Surrey on 25 April, email me at anitajchapman@gmail.com, and I’ll send you further info. I only joined Twitter last year and having a writing blog and two self-published story collections, it has definitely.been the right thing to do. 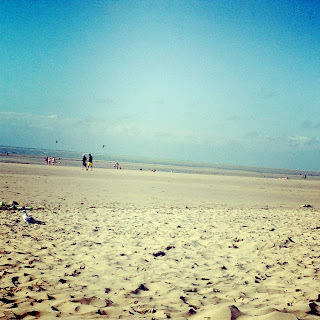 The information, connections and new online friendships I've made have been invaluable (and without Twitter I'd never have found this hugely useful blog). Great post, Anita. I’ve been on Twitter for quite a long while now, and find it invaluable, for all the reasons you mention. I reluctantly dipped my toe in the Twitter sea four months ago when it was strongly advised by a potential publisher. I think I've got the hang of it now - although I've had to ask Anita some pretty basic questions. I had a thriving Facebook profile but now find, for writing purposes at least, that I prefer Twitter. I agree with all of Anita's comments above. I have writer friends with no social media platform and they are struggling. I, on the other hand, have bundles of shiny new friends and some fab writerly resources at my finger tips. And it was lovely to wake up one morning and find God had followed me overnight - my writing is clearly better than I thought. How did you get God to follow you Jenni, after only a few months? He still won't follow me back, after almost 4 years ;-). Thanks so much for persevering with leaving a comment!-sorry it was difficult, hope it's nothing to do with my blog (let me know off piste if there's anything I can do to make the process easier. I know that if you're on Blogger, a Google account comes up automatically, but it not, another option is to go anonymous. Great blog, Anita. I have mixed feelings about Twitter but you've made me realise I could do more to make the most of it. Thanks very much Katrina, and for reading my post. Best of luck! Great advice. Twitter is essential these days! Thank you for a very interesting post. I can see that I'll be spending next weekend working out how to get started on Twitter. Thanks very much for reading it, April. Best of luck!